Rega DAC-R review | What Hi-Fi? We were big fans of the original Rega DAC. Reviewed back in 2012, this brick-shaped black box delivered a combination of detail, dynamics and rhythmic ability few rivals could better. Its only obvious shortcoming was an USB input that was limited to a sampling rate of just 48kHz. This wasn’t a massive negative at the time, as the availability of high-resolution recordings with sampling rates of 88.2kHz or higher was limited. But things have improved notably on that front over the years. The most obvious difference between the DAC-R and its predecessor is that the new unit can now accept 24-bit/192kHz music streams through all its inputs. Rega hasn’t been tempted to include DSD compatibility though, which is a shame as most recent rivals have added this format to their armoury. Such recordings are a certainly a minority interest at the moment, but we would prefer to have the option whether to play them. The rest of the DAC-R’s design is entirely familiar and none the worse for that. However, take a look at the dimensions on the spec list and you’ll see the new model is a few centimetres deeper. The casework looks pretty much the same as before, an immensely solid-feeling mix of aluminium and steel. Finish is good, though the product has a workmanlike quality to it rather than an aura of luxury. The DAC-R’s front panel is a simple affair with just three buttons – power, input and filter settings. There are six digital filter options – three for signals with sampling rates below 48kHz and three for above. There is no right or wrong choice and, as usual, much depends on the partnering system and personal taste. In our system we alternated between Filter 1 and 2 (these are Linear Phase and Minimum Phase variants) depending on the recording. Take a look inside and you’ll find that, revamped USB module aside, much is familiar. Rega has taken great care with the basics – optimising signal paths, component quality and the power supply arrangement. A good deal of effort has gone into reducing noise – both internally generated and that coming in from the source. The unit’s back panel shows a good range of connections. Alongside the asynchronous USB (which puts the DAC in charge of the timing of information flow not the computer) you'll find two opticals and a pair of coaxs. Another slight change from the first model is the use of a traditional IEC mains lead rather than the less common cloverleaf design originally used. There’s the option of both optical and coax digital outputs, but most people will just leave these unused. 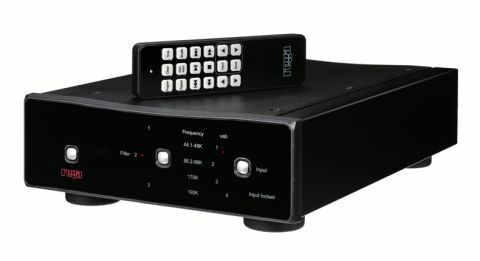 The DAC-R comes with a system remote, which can be used for is changing inputs. The multitude of buttons operate other Rega components. Those familiar with the last model will recognise Rega’s sonic signature instantly. Through either the coax or optical inputs the DAC-R produces a wonderfully appealing sound. It’s a sparkling performance, full of drive, delivering music as varied as Stravinsky’s The Rite of Spring and Kanye West’s Yeezus with conviction. We love the Rega’s expressive dynamics – the way it builds the crescendos in the Stravinsky piece while managing to resolve nuances in the quieter sections is impressive. It’s brilliantly organised too, keeping all the instrumental strands in place even when the music gets complicated. When it comes to Yeezus, the Rega is surefooted rhythmically and never short of insight or punch. This is a solid sounding presentation with a good supply of heft and authority. Rivals such as the Audiolab M-DAC pull ahead when it comes to outright spaciousness and the ability to render a wide-open sound stage. The Audiolab arguably delivers a more textured sound through the midrange too, giving vocals just a bit more subtlety. But the shortfalls aren’t serious and the Rega counters with more convincing timing, a firmer grip on bass and a greater dose of dynamic punch. Change to the USB input and the story isn’t quite so positive. We use an Apple MacBook Air loaded with Pure Music software and are surprised at how limited the performance is in relative terms. Through this input the Rega loses a notable chunk of its insight as well as being nowhere near as thrilling. Rhythm tracks lose a little snap while dynamics are neutered compared to the sound through the other inputs. It’s still a listenable, balanced presentation but the energy and insight heard through the other inputs is reduced. The same USB versus coax comparison done with the Audiolab M-DAC shows far smaller levels of degradation. If you’re going to use the Rega DAC-R with anything other than the USB input you’ll end up with one of the best sounding number-crunchers £600 will buy. It’s energetic, yet has enough in the way of subtlety to impress. But if you’re going to use USB predominantly, there are better sounding options at this price.